It’s the weekend and the second round of fixtures. I’m in Ha Noi. Instead of making the long trip to Pleiku, where Ha Noi T&T take on Hoang Anh Gia Lai, I took my place among the various motorized (and non-motorized) vehicles to jostle for position amid the manic morning traffic. 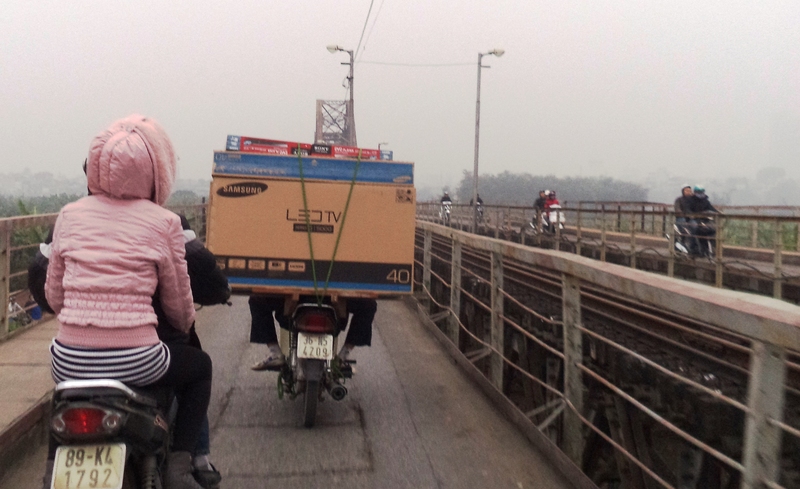 On this particularly bleak morning I was heading to work, some 10km to the eastern district of Long Bien. It seems the powers in charge of the 2014 seasons scheduling neglected to take in to account that I have a job. Why would anyone schedule a football match at 4pm on a Friday afternoon?! Joking aside though, the majority of people will still be at work and kids(often regarded as the fans of the future) will be in schools or universities. Surely if the FA wants to improve the image & respectability of the VLeague, a full stadium would be a great start. The continuing development of Indian league football these past few years is a great example, where large crowds regularly feature in the domestic game. Most importantly, there’s a match to be contested by two of the strongest teams in the country. 1st v 3rd from last season. HAGL, who didn’t play last week due to the odd number of clubs this season, would be up against T&T. Ha Noi entered the game fresh from an excellent (second half) display against Binh Duong, running out eventual 4-2 victors on the opening day. I’d figured I could catch the second half on TV, leaving my school instantly as the drum sounds, heading straight for the convenience store to collect a beer or two (it’s Friday after all) and easily be back in time as the half time commercials finish. TV switched on. Half time and Ha Noi T&T were a goal to the good, thanks to a fine finish from Van Quyet. Soon after the break Samson doubled the lead. It all seemed rather comfortable, against a team that will surely prove to challenging for the title come August. This was until Sam Gallagher was harshly judge to have committed a foul in the box. Penalty, 2-1. HAGL then pressed for the equalizer. The game stretched out and both midfields disappeared for awhile, as it was long ball end to end action. HAGL hit the woodwork and Hong Son was forced into a smart save. After a nervy period of play Ha Noi T&T killed of the game in style with 2 goals in the last 8 minutes. 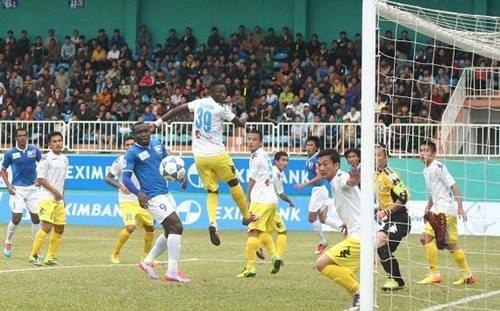 Firstly, substitute Ngoc Duy sent in a free kick that deceived everyone and crept beyond Akpan in the HAGL goal. Then, Van Quyet raced clear, rounded the keeper and slotted home. 4-1 away in Pleiku; a fantastic result. In other matches, Le Cong Vinh scored his first goal for SLNA since returning from Japan, as the Vinh based team thrashed newcomers Quang Nam 6-1. Promoted side, Quang Ninh, upset super cup winners Ninh Binh away from home,3-1, while Thanh Hoa secured an impressive home win against DaNang. Hai Phong and Dong Nai drew away at Long An and An Giang, respectively. View the latest table here. Click for results and latest table.